Sometimes you get into a food kick and find yourself eating the same type of food over and over again, or maybe not even the same type of food, but there’s a recurring theme to what you’re eating. You know there’s Meatless Monday, and Taco Tuesday. For a period of time earlier this year, my husband and I found ourselves on a “brunch” kick. We’d find ourselves out to brunch on the weekends on a number of occasions. For us, brunch is the perfect marriage of what we both enjoy. My husband enjoys breakfast foods as he’s a lover of egg dishes and fresh baked breads, etc. For me, I’m not so much a breakfast eater as I like more substantial food, so a heartier lunch menu is more up my alley. Brunch is the perfect marriage of having a mix of more traditional breakfast menu items with bread and eggs and juice as well as offering a bit of a heartier, heavier fare that could pass as lunch food. 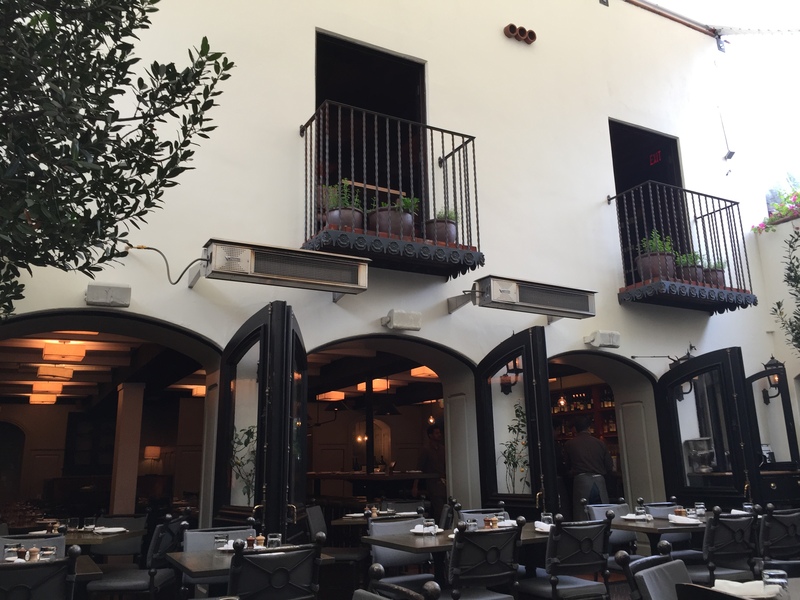 My husband came across a suggestion for a popular brunch spot located in West Hollywood, only a few blocks away from Cedars Sinai Medical Center, and only a few miles away from where we live. What sold my husband and I was the fact that the restaurant has and outdoor dining patio which we thought would be a perfect place to dine on a lazy Sunday morning. A.O.C. Wine Bar was the second in a long line of collaborations between two restaurateurs, Caroline Styne, who runs the business and wine side of the business, and Suzanne Goin, chef and James Beard nominee and award winner who runs the food operation. While their food empire has expanded and grown many times over, A.O.C. Wine Bar continues to win acclaim as a top-notch wine bar featuring a multitude of wine by the glass and small plates meant to be shared family-style. 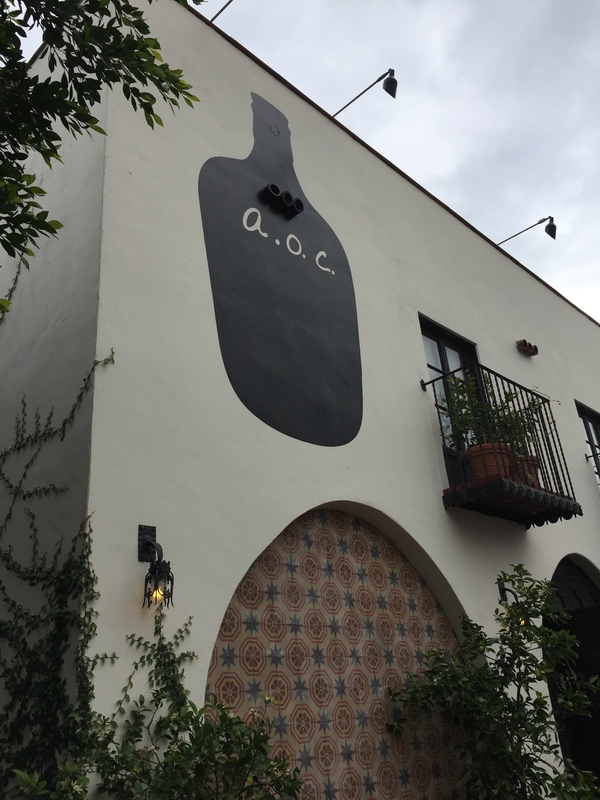 A.O.C.’s brunch menu leans heavily on a wide range of menu items that come out of their wood-burning oven and also includes their famed small bites meant to be shared. 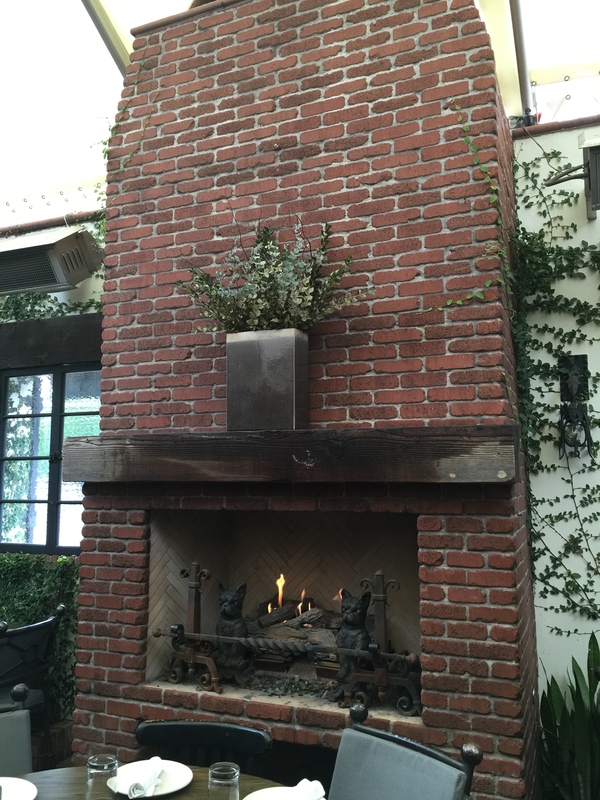 While my husband and I had made brunch reservations specifically requesting a table in their garden patio, I was a bit concerned heading over to the restaurant because this happened to be one of those rare Southern California days when rain was forecasted and expected to fall during our brunch. It would be a shame to forced indoors when we were so looking forward to outdoor patio dining. We were quite surprised and delighted when we arrived to A.O.C. to discover that their outdoor patio and garden area was actually a completely enclosed area. It gave the appearance of an outdoor dining space that was designed to look and feel like you were dining al fresco on the back porch and garden area of someone’s home, full of light and color and atmosphere, but yet enclosed by some sort of frosted plexi-glass type ceiling structure that protected you from any of the outside elements. It was a cozy, comfortable and relaxing place to enjoy a lazy Sunday morning brunch. Brunch leaves you a bit limited sometimes as far as drink selection goes. Ok, there’s the Bloody Mary or Mimosa or some other cocktail drink, but that’s not quite how I roll. 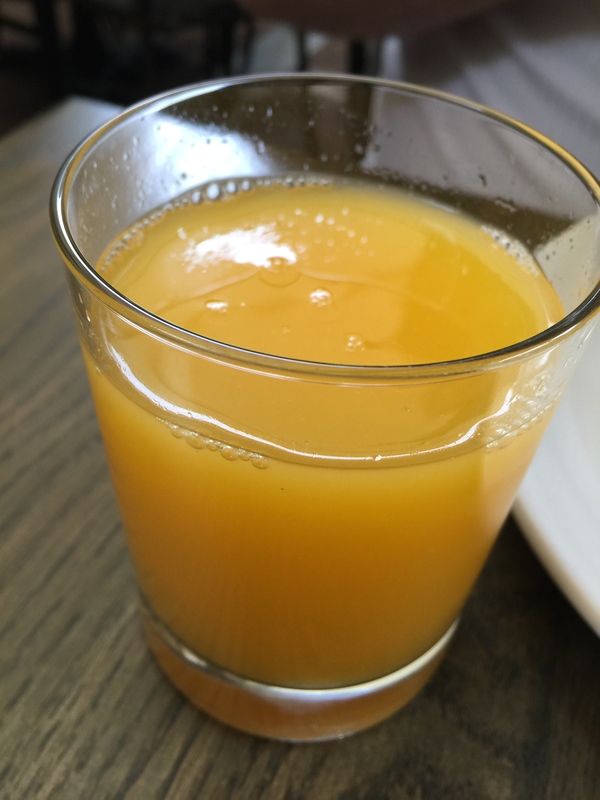 My husband, the ultimate lover of orange juice took one look at the drink menu and immediately decided that the fresh squeezed orange juice was good enough for him. He’s a sucker for fresh squeezed orange juice and never fails to pass up on an opportunity for a glass of it. Tart, tangy and a bit citrusy sweet is all he needs. I’m more of the caffeine lover, so a handcrafted latte was my order. I liked that instead of packets of sugar, I was offered a cubed raw brown sugar to help sweeten my strong brew. It’s the little things that I enjoy. 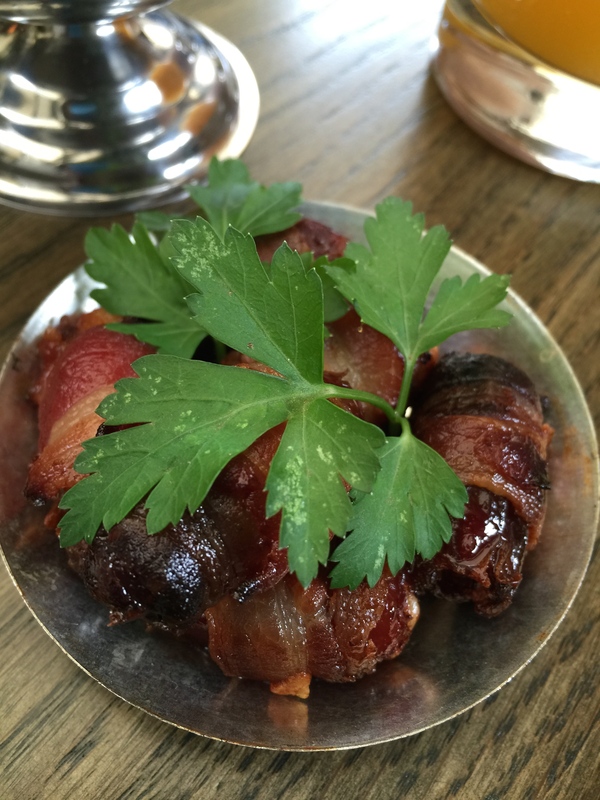 As we perused the brunch menu, my husband zeroed in on an item from the charcuterie section of the menu that he told that he really wanted to try, the bacon-wrapped dates & parmesan. My husband knows that I’m not a fan of dates, and we’ve been other places before where he ordered bacon-wrapped dates and I declined to have any, so I told him this was all for him. A cute little plate was brought to our table with some bacon-wrapped dates and a garnish of parsley that was almost as big as the little plate was. My husband picked up the first bacon-wrapped date, popped it in his mouth and couldn’t stop gushing over how amazing the little bite-sized dates were. He described how delicious the bacon was, perfectly salty and thick enough to have some meat on it, and how sweet the dates were and then the finish of a salty bite with the parmesan cheese stuffed inside the date. This was to be the first of the items we ordered that were cooked in A.O.C.’s wood burning oven, which we quickly came to realize really enhanced the flavor of everything they served. My husband urged me to give these little dates a try and even cut one up in half for me to nibble on. I gave in and decided to give it a try and discovered, much to my surprise, that it was quite tasty. My husband was right, it’s something about the wood-burning oven and the bacon that just transformed the bacon into something wonderful. After that one half-bite of date, I decided to even have my own whole bacon-wrapped date. I could see what the appeal in these little puppies was. It was really tasty. 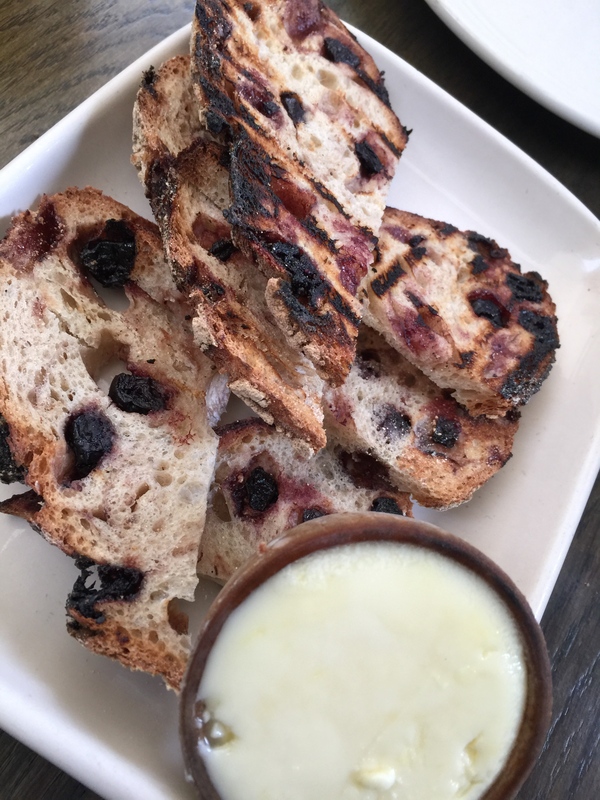 Our next item was something that, again, I’d probably not order on my own, but was something that I had heard was to-die-for and I knew my husband would really like, grilled blueberry bread with lemon butter. This was to be the second out-of-this world item that we ordered to come out of A.O.C.’s wood-burning oven that absolutely blew us away. For my husband, the ultimate lover of blueberries and admirer of lemons, this dish was right up his alley. Fresh baked bread grilled to a nice crunchy crispness right out of the wood-burning oven served with a side of lemon butter, there’s too much in this dish to resist. I do not like blueberries, but I have to admit that the aroma wafting off the bread when it was brought to our table was too much to resist. The bread was absolutely fantastic, warm and crusty and crunchy and perfectly grilled. The grilling of the blueberries really brought out the sweetness in the berries and almost caramelized them in a way. The lemon butter was fantastic, creamy and rich but with that citrus, acidic tang to balance out the sweetness. The combination of the acidic lemon with the caramelized sweetness of the blueberries was a match made in heaven. My husband said that this bread reminded I’m of being a kid, so it brought back some good memories for him. The idea of grilled blueberry bread and lemon butter is such a simple one, but at A.O.C. it’s executed so perfectly that it makes you wonder why you’ve never had fresh baked bread so good in your life. 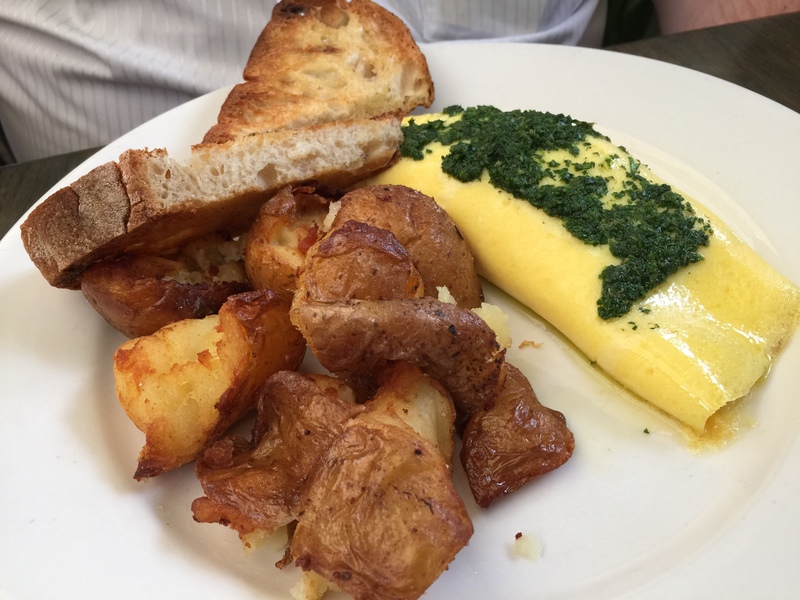 For brunch, my husband chose the omelette with Gruyère, croutons and salsa verde served with a side of fried potatoes and toast. My husband really liked this classic French preparation to his omelette. The addition of the croutons inside the omelette gave the omelette great crunch. and of course the nutty flavor of the Gruyère was a great addition. And the salsa verde added some needed saltiness to the omelette. Overall, the omelette was cooked well and very tasty. And of course, my husband really liked the grilled, crusty bread that came with his meal. Everything that came out of A.O.C.’s wood-fired oven was such a treat. To go along with our dishes, my husband and I ordered a couple of side dishes. 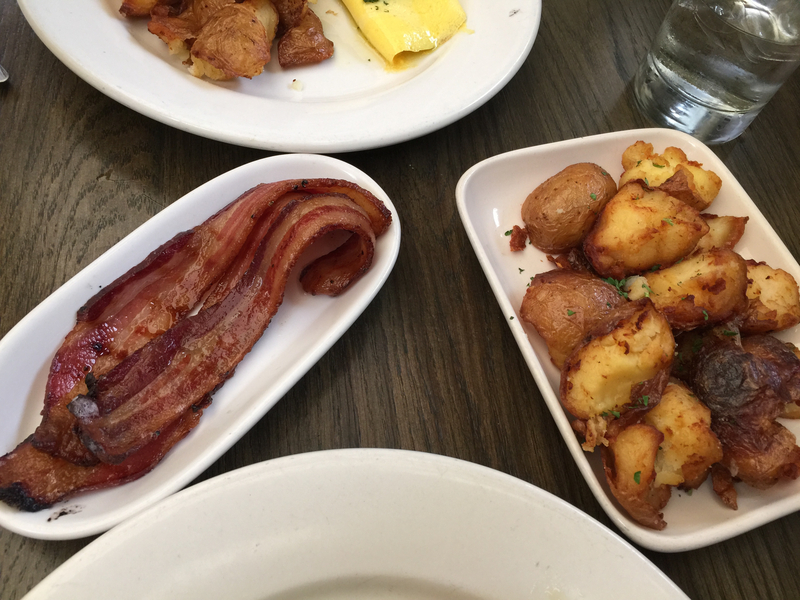 My husband’s dish may have come with fried potatoes, but mine didn’t and I love potatoes, especially for breakfast. So, I couldn’t help but ordering some as a side dish. These potatoes were so delicious. I love that they were of a good size, basically a baby potato that was halved, so it had a lot of meat to it. They were perfectly fried on the outside and soft and fluffy on the inside. These fried potatoes looked like homestyle potatoes, but they tasted way better than any potatoes I could ever make at home. My husband wanted a side of vande rose bacon to go with his meal since he didn’t get any bacon with his meal. My husband’s first reaction was that the bacon was “amazing!” And I had to agree. We both thought that the bacon was perfectly cooked, softy and tasty. The bacon was perfectly undercooked and we both attributed the great smoky flavor of the bacon to the wood-fired oven. Great choices for side dishes. For my dish, I chose the A.O.C. 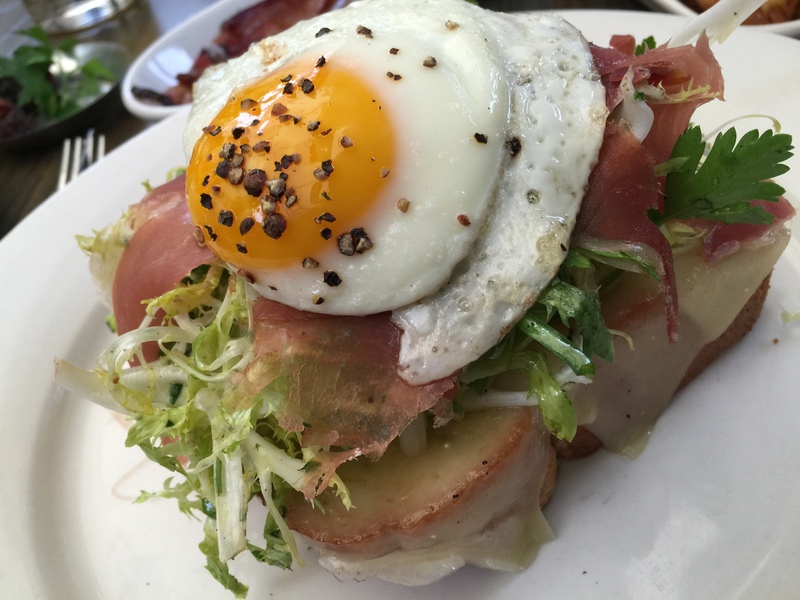 brioche with melted Gruyère, frisee, prosciutto and a sunny-side up egg. A little cracked black pepper on my brioche at the table, and this dish looks divine. First off, the brioche bread was amazing. I loved the thick cut of the bread so as to stand up to all of the “toppings” on what was essentially an open-faced sandwich. The brioche had great flavor and I like that it was toasted so that it remained crunchy. The nutty Gruyère cheese was melted right over the top of the brioche. You can’t ever go wrong with Gruyère. Atop the bread and cheese was a bed of frisee that added a perfect touch of bitterness to the dish. Then a little salty prosecution and a perfectly sunny-side up egg. Cut through the egg to get the yolk runny through the frisee and the brioche and everything on the plate comes together really well. I thought that the flavors of the cheese and the bread and the prosciutto all together were just a great match, and everything was so perfectly seasoned. This was just a terrific, and filling dish. By the end of our meal, my husband and I were both kind of full, but we wanted to try a dessert, so we decided we’d split a dessert between us. After looking at our options we chose the butterscotch pot de creme with fleur de sel and salted cashew cookies. First off, the butterscotch pot de crème was fantastic. The flavor wasn’t too rich or to sweet, and the pot de crème had the perfect consistency. The homemade whipped cream was also unsweetened, which was perfect as it also helped to balance out the flavor of the butterscotch and create a creamy consistency to the pot de crème. 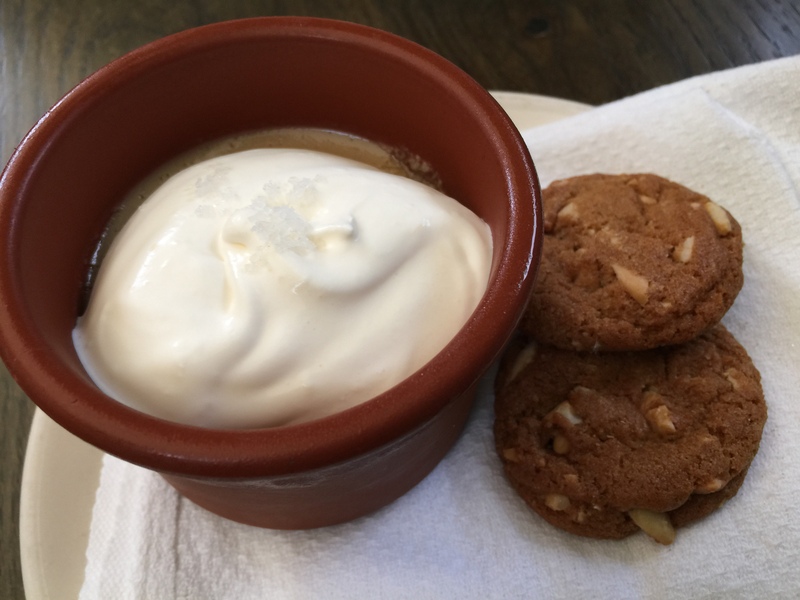 My husband loved the salted cashew cookies as they served as the perfect vessel to scoop a couple of spoonful’s worth of butterscotch pot de crème before he popped the cookie into his mouth. I also thought that the flavor of the cookies was terrific, chewy inside and crunchy on the outside, and I don’t even like nuts. 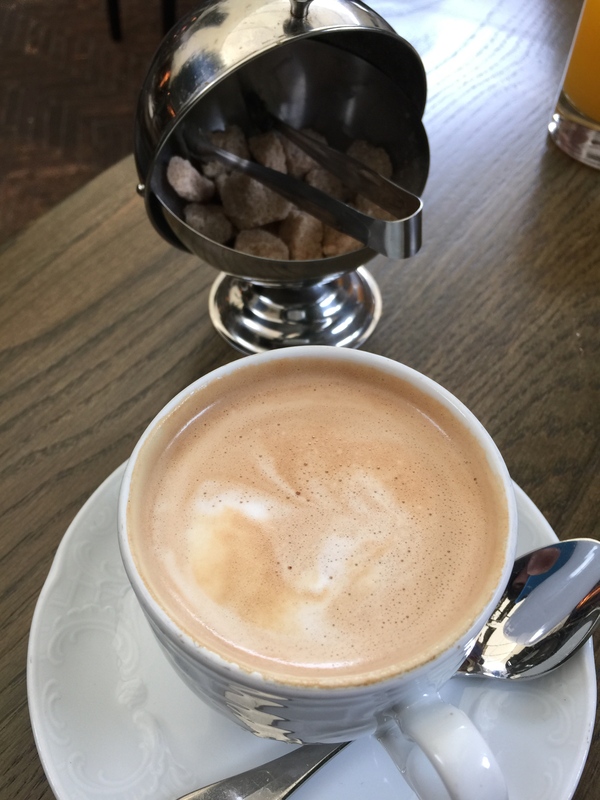 The addition of the fleur de sel with the pot de crème was great as it again helped tame the sweetness of the butterscotch as well as adding just a finish touch of saltiness to each spoonful of the pot de crème. I really enjoyed this dessert much more than I had anticipated that I would. Our brunch at A.O.C. Wine Bar was fantastic. 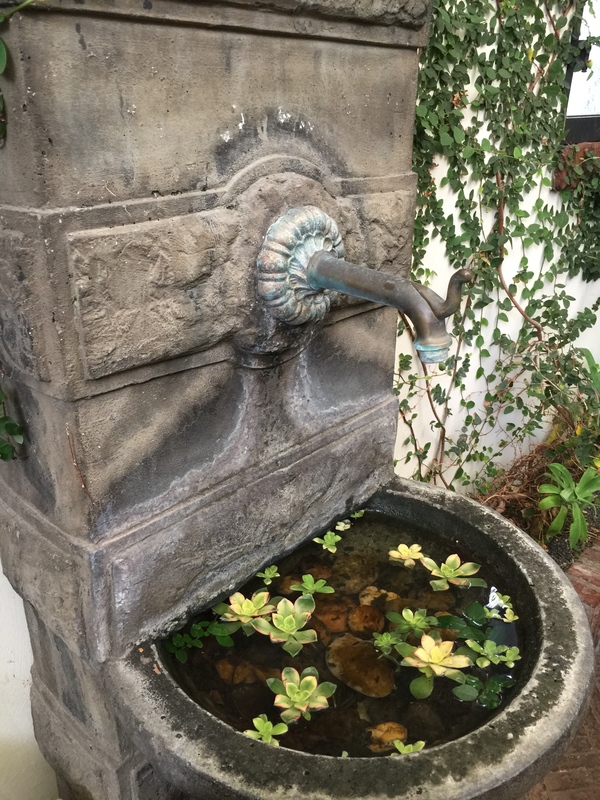 My husband and I both loved the atmosphere of sitting in restaurant’s outdoor garden patio. We had made reservations for brunch in advance and arrived just as the restaurant opened, and while initially there weren’t very many people at the restaurant for brunch, after about an hour, people started streaming in, seemingly undeterred by the rain that was really starting to come down. At that point, we were glad we had made reservations. During our entire brunch, we both kept saying that we wanted to come back to A.O.C. in the future for dinner because if their dinner menu was half as good as their brunch menu, we’d be more than satisfied. The wood burning oven that A.O.C. uses for their breads and other dishes produced food that we both found to-die-for. Their blueberry bread with the lemon butter was a true winner. My husband and I both agreed that we thought that A.O.C. was a better brunch experience for us than Cliff’s Edge if we were comparing our dining experience. First off, for us A.O.C. was a lot closer to home and easier to get to. And while both restaurants featured outdoor dining, we really enjoyed the garden patio set up at A.O.C. more, not to take anything away from the adult treehouse feel off Cliff’s Edge, but A.O.C. was more our scene. And finally the food, A.O.C. was the winner by a hair, and that’s strictly due to their wood-burning oven. Believe me, my husband and I will be back at A.O.C. again as I don’t think we can stay away. That blueberry bread and lemon butter looks amazing!! I’m not a huge brunch person just because I don’t care for the scene here – it’s like the “cool-person-weekend-thing-to-do” and it’s always loud and crowded, but I usually like brunch food okay. I need to get out to brunch more.